After many years, Nell has finally forgiven Tom for his indiscretion and has determined to get on with her life. Nell has decided to become a teacher and though it's not nearly as exciting as the life her siblings have created, for the most part, Nell is content. When her student Charlie goes missing, Nell is determined that she must find him. Upon some investigation, it come to light that Charlie may be Tom's son and while that knowledge stings a little bit it does not dull Nell's determination. It's not long before Nell finds herself in close quarters with Tom on a mission to save Charlie and though she has forgiven Tom, it's been a long time since they have been close. Though this is the eighth book in this series, one need not have read the other seven to be able to follow what is going on. Those familiar with the Gaslight Chronicles series however will enjoy the brief appearance of several characters who have had their own books. We learn that they are all happy in their marriages and some have gone onto have children. Obviously the purpose of this novel is to bring together Tom and Nell for their HEA. The mystery itself was quickly resolved. As with any romance, Pape introduced a stumbling block to forestall the HEA and in this case, it is Nell's reticence because Tom slept with someone before they were properly engaged and then married as a result of believing that he had gotten the young woman pregnant. As much as Pape tried to stress Nell's desire for independence and a career, I could not help but find her to be a twit. Nell wallowed for eight years before deciding to start leading her own life. Who the hell wallows for eight years? Then there's the issue that at the time Tom slept with Polly, they had not even mentioned their feelings for each other. How exactly did Tom break Nell's trust? When Tom finally is free of his entanglements, Nell holds onto her stubbornness but suddenly without explanation, at the end of the book, Nell changes her mind and decides to marry Tom. Then there's the little matter of Roger, the man Nell promises to marry who suddenly breaks off the relationship when he learns that Nell can control people with her voice. Roger's speedy exit left room for Tom to sneak in and Roger was a useless unnecessary distraction. I must admit that I dreaded reading this story. From almost the beginning of the Gaslight Chronicles, Pape has made a big deal about the colour of Nell's skin. I understand that attitudes about race in Victorian England would not have been as evolved as they are today but the constant exotification of Nell is beyond tiresome to say the least. It made me want to scream, "I get it, Nell is half Indian get the hell over it." Pape never missed a chance to point out Nell's skin colour or the fact that she is biracial. Nell, for all intents and purposes is the "other" in the Gaslight Chronicles. It is then compounded by the fact that Pape decided to make Nell a princess. I rolled my eyes so hard and fast that I nearly hurt myself when I read that. Nell was well aware of the fact that she is of colour and does not shy away from it which is good but the way in which Pape handled race beyond that is problematic to say the least. "Maybe he is my Micah, as you seem to suggest. But more than anyone else here, you know what it's like to be different, to be darker-skinned than society expects, to be eyed with suspicion. Micah gave you refuse from that. A chance to live an ordinary life. That's no small thing." The problem of course is that everything brown or Indian was backward, dirty, wrong and even worth less. Nell even says that her biological mother described her father as "handsome, despite the hue of his skin." Nell's father even preferred steak and tea and biscuits to curry. Pape could have made some comment about internalized racism but instead continued on with her story as though the preference of a culture outside of one's own happens in a vacuum without the damage of colonialism. To be clear, there was nothing about British colonialism that did not have deleterious effect on Indian people. In fact, the harm continues to this day. When they arrive in India much is made of the untouchables and while the caste system certainly is and was and is a problem, it's not as though the 1800's was a great time to be poor in England what with work houses and debtors prisons. England was not more civilized than India, though it's oppression may have taken a different form. Nell and Tom who spent some of their youth in Wapping, would be well aware of the cruelties of the English class system and yet, Nell spent her time horrified by the untouchables, as though she had not experienced anything remotely like it in her life. As aforementioned a good portion of this book was set in Indian. I know that the purpose of the Gaslight Chronicles is steampunk romance however one cannot have a book set in this time period and not have a reasonable discussion of colonialism. In her author's note, Pape writes, "I have tried to render an accurate view of a Calcutta as it might have been in my steampunk world, without delving too deep into the politics of colonialism or the caste system." The only Indian characters in this story were those who chose to align themselves with the crown. Certainly, the colonialization of India would not have worked without those who conspired with the British but the way that Pape has set her world makes it seem as though colonization of India was not at all problematic. Pape includes the Viceroy, as well as the the horrible East India Company, without any commentary about how vicious their rule was for colonials. It belies the damage that British colonialism had on India and its people. One cannot simply brush aside something as significant as colonialism to get on with a rubbish romance. Reading as Tom so cavalierly destroyed rubies of significant value to forestall them falling supposedly into the hands of the wrong people, only served to indicate just how much Pape refuses to acknowledge what was stolen from the Indian people. The British routinely stole without compunction and declared artifacts meaningless, even as they rushed to house them in their museums. Once again, Aunt Dorothy was given a few lines. I can only assume that Pape created this character for the sake of inclusion cookies. In each book in this series, we are reminded that Aunt Dorothy is a lesbian with a long term partner but never learn anything about her beyond this fact. It's like she's a lesbian shark swimming in a sea of heterosexuality. Pape needs to either give this character something to do or stop referencing her altogether. Aunt Dorothy is less than a token and after eight books in this series, I am quite sure that she will always remain that way. On its own, the mystery of the missing children, even though it served as a background to get Nell and Tom to their happily ever after would have been enough. I can even forgive Nell's stupidity and stubborness when it comes to Tom. What I cannot forgive is the way that Pape evaded the issue of colonialism for the most part and turned Nell into an Indian princess. It's safe to say that Pape should never set a story outside of Britain again, nor should she ever write about another character of colour. 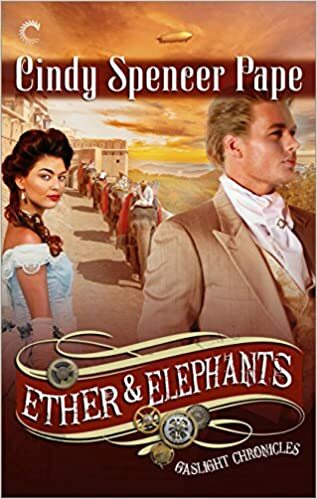 Ether & Elephants is an almost perfect example of the white gaze and should only be read by those interested in how someone can get race and colonialism so entirely wrong in 83.160 words.